Research-based, certified wildlife control training programs to solve human – wildlife conflicts. Your source for animal handling, control methods, and wildlife species information. Figure 1. Eastern chipmunk (Tamias striatus). Photo by Tom Tetzner, US Fish and Wildlife Service (USFWS). Understand the biology of the eastern chipmunk. Identify signs of chipmunk activity and damage. Describe how chipmunk behavior can influence methods used for managing damage. Explain appropriate options for managing chipmunk damage. Eastern chipmunks (Tamias striatus) feed on garden vegetables and flowers. They dig burrows that can disrupt patios, stone walls, and sidewalks. Occasionally they enter structures. Chipmunks may be protected by regulations in some states. Most states allow landowners to capture and kill chipmunks when they are causing, or about to cause damage. The eastern chipmunk (Figure 1) is a common, native species in the northeastern US. They spend most of their time on the ground, and when startled, run with their tails upright. Eastern chipmunks are 5 to 6 inches long and weigh 3 ounces. Two tan, and 5 black longitudinal stripes occur on the back, and 2 tan and 2 brown stripes occur on each side of the face. The stripes end at the rump. The tail is 3 to 4 inches long and hairy. Eastern chipmunks occur throughout the northeastern US. Chipmunks are not important carriers of diseases harmful to humans. All rodents are susceptible to Lyme disease. Eastern chipmunks mature within a year, and mate twice per year, during early spring and summer through early fall. They have a 31-day gestation period. Two to 5 young are born in April or May, and again in August or October. Chipmunk burrows are often well hidden near objects or buildings (e.g., stumps, wood piles, brush piles, stone walls, and basement or garage foundations). The burrow entrance usually is about 2 inches in diameter. No obvious mounds of soil occur around the entrance. The main tunnel typically is 20 to 30 feet in length. Burrow systems normally include a nesting chamber, 1 or 2 food storage chambers, various side pockets connected to the main tunnel, and separate escape tunnels. With the onset of cold weather, chipmunks are inactive from late fall through winter. They do not enter a deep hibernation, and rely on the cache of food stored in their burrow. Some individuals become active on warm, sunny days during winter. Most chipmunks emerge from torpor by early March. Chipmunks generally are solitary, except during courtship, or when rearing young. Eastern chipmunks live in deciduous forests, and prefer areas with rocky or shrubby protective cover. They often are present in parks and backyards. Home ranges of chipmunks may be up to ½ acre, but adults only defend a territory about 50 feet around the entrance of their burrow. Densities of eastern chipmunks may be as high as 10 animals per acre if sufficient food and cover are available. Chipmunks primarily eat nuts, berries, seeds, mushrooms, insects, and carrion. Chipmunks cache food in their burrows throughout the year. By storing and scattering seeds, they promote the growth of various plants. Chipmunks also prey on bird nestlings and eggs. Chipmunks have a sharp “chuck-chuck-chuck” call. Their warning call is a high pitched “wee,” which commonly is heard when they feel threatened. Chipmunks usually are quite noticeable, as they are active during daylight hours. 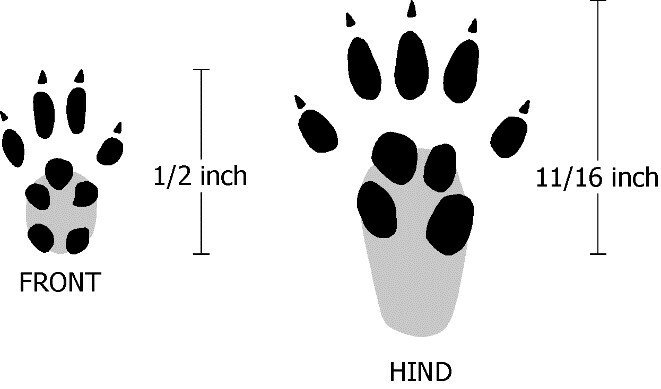 It is rare to find tracks of chipmunks (Figure 2). Figure 2. Tracks of an eastern chipmunk. Image by Dee Ebbeka. Most damage by chipmunks occurs in home landscapes where vegetables are damaged, or birdseed and flowers are eaten. Chipmunks do little damage to lawns. 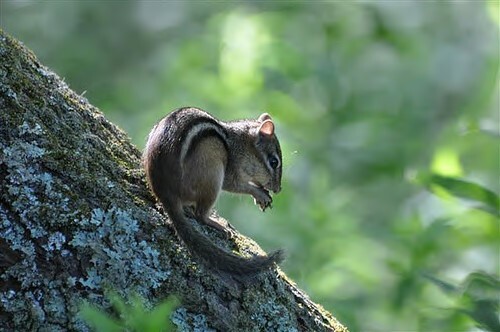 Chipmunks pose a minimal threat to crops, livestock, and pets. When chipmunks are present in large numbers, they can cause structural damage by burrowing under patios, stairs, retention walls, and foundations. Their burrows can damage pool liners. Their digging may undermine retaining walls and cause collapse. 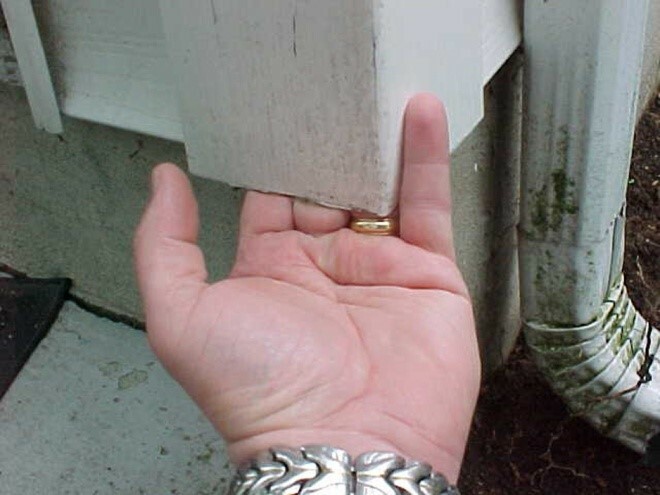 Chipmunks typically enter buildings along the sill plate, through dryer vents, along the roof line, and under siding (Figure 3). Figure 3. Chipmunks sometimes access buildings under siding. Photo by Stephen M. Vantassel. Homeowners should use bird feeders that capture fallen seed to reduce the amount that reaches the ground. Stack firewood away from buildings to deter burrowing near homes. Avoid planting landscape features (e.g., ground cover, trees, and shrubs) that connect wooded areas with the foundations of homes. Remove stone walls, or fill gaps and holes with mortar. Use ¼-inch-mesh hardware cloth to exclude chipmunks from flower beds. Cover seeds and bulbs with ¼-inch-mesh hardware cloth. Keep chipmunks out of structures with hardware cloth topped with sheet metal. Use hardware cloth, Copper Stuff-Fit, or Xcluder™ to close openings before they gain entry. For active burrows, wait until the animals are out and away, fill the holes with soil, and cover them with rocks or other heavy objects. No devices are effective at frightening chipmunks. Taste repellents that contain capsaicin, Bitrex®, or ammonium soaps of fatty acids can be used to protect flower bulbs, seeds, and foliage. Multiple applications of repellents are required. Fox or coyote urine is registered for repelling animals from lawns and gardens. Follow all label instructions. There is little research to evaluate the effectiveness of repellents for deterring chipmunks. There may be Special Local Needs 24(c) registrations for site-specific use of toxic baits for chipmunk control. Check with your state wildlife agency for restrictions or permits required to shoot chipmunks. Shooting chipmunks may reduce the local population if the shooter is persistent. Use air rifles, .22-caliber rifles, or shotguns with No. 7½ shot. Local or state laws may limit discharge of firearms in suburban areas. Trapping is practical for eliminating chipmunks in areas less than one acre. To determine the number of traps needed, quickly scan the site, count the number of chipmunks and multiply by 3. Follow-up trapping may be required to remove animals that immigrate from the surrounding area. Set all traps in areas where damage is occurring, next to active burrows, or on active runways. Cage traps (Figure 4) for chipmunks should be at least 3 x 3 x 10 inches with fine mesh (¼-inch). Use peanut butter or pieces of fruit, vegetables, nut meats, or sunflower seeds as bait. Place bait in the back of the trap to avoid attracting birds. Figure 4. 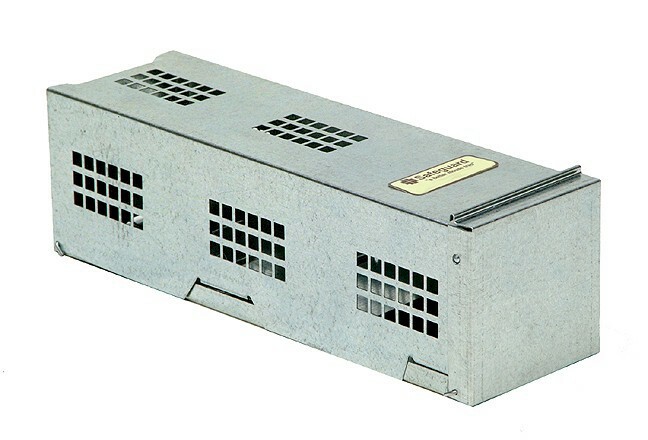 Safeguard® 53070 rodent trap. Image by Safeguard®. Rat-sized, snap-traps can be used to kill chipmunks. Place traps under inverted wooden boxes with a 2-inch hole cut in each end, or use rat-sized bait stations to reduce capture of non-target animals. Conceal snap traps that are set against structures by leaning boards over them. Relocation of chipmunks is not feasible except in rescue situations. Translocation is not recommended for chipmunks. If legal in your state, release chipmunks at least 3 miles from their capture site. Avoid this option for chipmunks in late summer, as translocation will separate them from their winter food cache. Carbon dioxide is an appropriate method of euthanasia for chipmunks. Government or private agencies, universities, extension service.